How do I enable photo and video sync from my phone to MightyText? To try it out, click the Photos & Videos tab in MightyText web or tablet app. If you turn on the feature, we will start by syncing some recent photos and videos from your phone to MightyText. These should show up instantly if your phone has an internet connection. 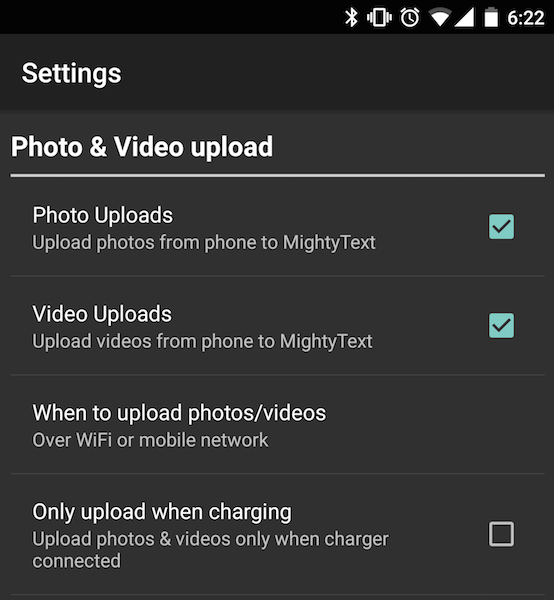 There are separate check boxes for Photos and Videos uploading in the MightyText Android phone app settings. Photos and Videos will only upload to MightyText if these are checked on. If at any time you would like to disable this feature, simply uncheck these settings on your phone or in the MightyText web app settings. When will Photos & Videos will upload? Phone's Data connection: You can choose to have Photos & Videos upload only over a WiFi network, or you can let uploads happen when the phone is on WiFi or mobile carrier data network. Mobile data connection size limit: If a mobile data connection is being used, then only Photos & Videos that are less than 25MB in size will upload. Photos & Videos larger than 25MB will upload once you are on a WiFi connection again. Only upload when charging: If you would prefer that your Photos & Videos only upload when your phone is charging, there is a setting in the phone app you can enable. Low Battery upload pausing: If your phone battery level is at 5% or below, photos or videos won't upload to MightyText. Once your phone battery is above 5% again, the upload will start. In addition to those photos and videos taken on your phone, photos and videos from apps on your phone like Snapchat, Instagram, Whatsapp, and others will upload to your Photos/Videos gallery as well. 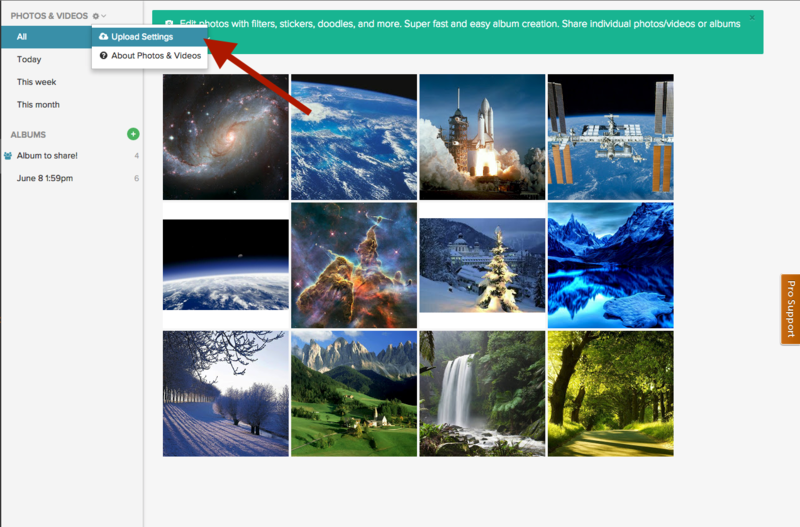 You can also manage the Photo Uploads and Videos Uploads settings directly in the web app. 2. Click the gear icon in the Photos & Videos banner. 3. Click Upload Settings from the drop down menu. 3. 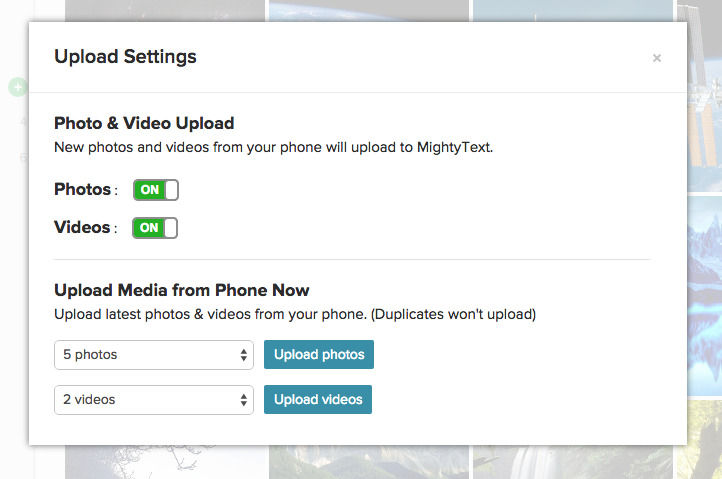 In this modal, you can toggle the upload settings for Photos and Videos separately. You can also upload the latest photos and videos from your phone. Your photos and videos should not be duplicated when you do this. Note: Your phone must be turned on and have an internet connection in order to update your settings or to upload photos and videos from this modal.